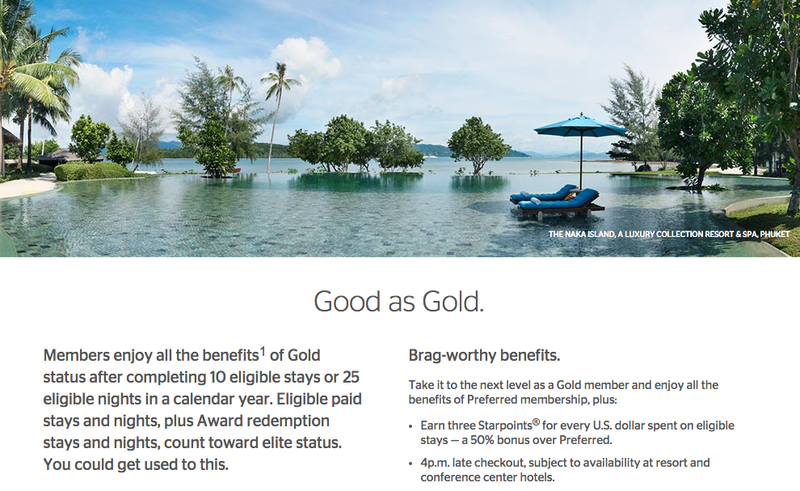 What is Starwood Preferred Guest Elite Status Worth in 2016? If you’re wondering whether it’s worth meeting the requirements for a specific hotel program status, it helps to know what sort of value you can expect as an elite member. 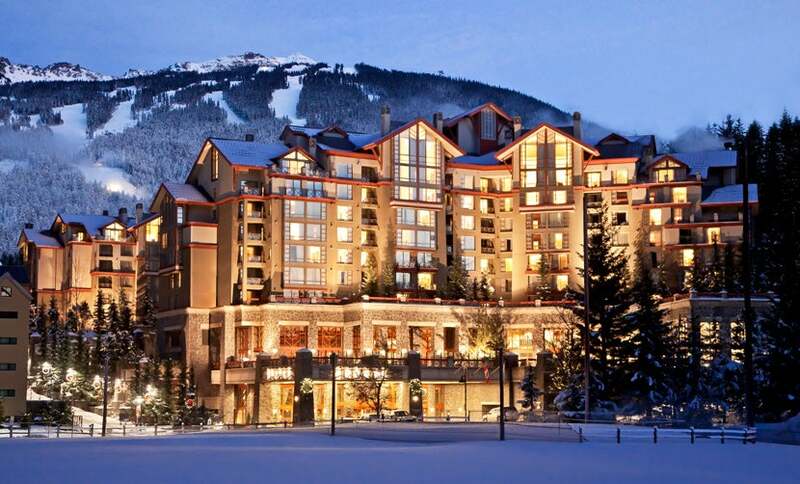 Below, TPG Senior Points & Miles Contributor Nick Ewen completes the hotel portion of his series on elite statuses by examining how much value you can get with the different levels of the Starwood Preferred Guest program. Here at TPG we’re constantly asked questions like, “Is it worth it for me to earn ____ status with ____ airline/hotel chain?” This is a relatively challenging question to answer, as there are many factors that come into play when deciding your ideal program. Last month, I kicked off an update of last year’s series that quantified the value of elite status at the various hotel chains by looking at the Hilton HHonors, Hyatt Gold Passport, Marriott/Ritz-Carlton Rewards and IHG Rewards programs. Today, I’ll finish the series by examining the elite tiers of the Starwood Preferred Guest program. What is Starwood Preferred Guest elite status worth? Before getting into the analysis, a couple of disclaimers. First, it’s important to note that these mathematical analyses represent just one way of calculating the value you’d get out of a given elite status level. You probably have your own way of calculating how much value you can get from these programs; if you travel exclusively for work and rarely spend time in your room, you may not care about upgrades, and if you aren’t a big breakfast eater, the free breakfast benefit probably won’t matter much either. Just like with any analysis, feel free to adjust the numbers to make it more relevant to your own personal situation. Second, these numbers are all based on the benefits you’d enjoy after achieving the given status level and continuing to qualify each year thereafter. If you’re starting from scratch or if you suddenly have a drop-off in your travel, the calculations become significantly more complicated. You complete 20% more stays than the minimum required for a given status level. You spend an average of $400 per stay on qualifying charges. You spend 60% of your stays at full-service properties (like Westin) and 40% at discount properties (like Four Points or Aloft). As always, be sure to adjust these numbers based on your given travel patterns. Those who stay almost exclusively in big cities may wind up paying significantly more per night, while those who typically travel outside of major metropolitan areas or who have mostly one-night stays will probably have a lower cost per stay. Three final bits of information: For the sake of this analysis, I’m valuing any bonus points earned based on TPG’s most recent valuations, which peg SPG points at 2.5 cents apiece. In addition, I’m rounding all of the individual benefit valuations to the nearest $5 to make the math a bit simpler. Finally, I’m not including benefits offered to all guests, like the complimentary internet perk that kicked in as of February 2015 and the new partnership with Uber. Gold members enjoy a variety of benefits at SPG properties, including bonus points and free premium internet. The lowest level in the program is Gold status, which is typically earned after 10 stays or 25 nights. It’s also included as an automatic benefit on The Platinum Card® from American Express (for instructions on how to activate this benefit, check out this post). You can also earn Gold status by spending $30,000 in a calendar year on either the Starwood Preferred Guest Credit Card from American Express or the Starwood Preferred Guest Business Credit Card from American Express. For this analysis, I’ll base my numbers on completing 12 stays (seven at full-service, five at discount properties) and spending $400 each stay (so a total spend of $4,800). 50% point bonus ($120): Gold Preferred members will earn 3 Starpoints per dollar spent, a 50% bonus over regular members. With $4,800 in spending, that equates to 4,800 extra points, worth $120. Late check-out ($25): Unlike the late check-out policies of other chains, SPG gives Gold members a guaranteed 4pm check-out, though it’s based on availability at resort, conference center and convention hotels. Upgrades ($300): Gold members also receive space-available upgrades to enhanced rooms at check-in, which may include corner rooms, higher floors or rooms with views. This benefit is not offered at Aloft or Element hotels but is available across the other brands, so I’ll use the same $25 per stay valuation I used for Hyatt and assume 10 of your 12 stays happen at applicable properties. Welcome gift ($60): You’ll also be able to select a welcome gift at check-in as a Gold member, either bonus points or a welcome beverage. Since this is The Points Guy, I’ll assume that you select the points (250 for full-service, 125 for discount properties). That works out to 2,375 bonus points, worth $59.38. Complimentary premium internet ($25): When you book directly with SPG, you’ll enjoy premium internet access during your stay. While this can be a nice perk, I haven’t noticed drastic differences in speed, so I’ll peg this at a conservative $25. Crossover Rewards with Delta ($15): Another benefit of Gold status is access to the Crossover Rewards program with Delta. This allows you to earn one Starpoint per dollar spent on eligible Delta flights, though you’ll need to sign-up for the program at this link. While this can be very lucrative for regular Delta travelers (especially on high-fare tickets), I’ll assume a conservative $500 in Delta purchases to earn an extra 500 Starpoints, worth $12.50. Platinum status brings a wealth of benefits at all SPG properties. The next level in the SPG program is Platinum Preferred status, which is typically earned after 25 stays or 50 nights. For this analysis, I’ll base my numbers on completing 30 stays (18 at full-service, 12 at discount properties) and spending $400 each stay (so a total spend of $12,000). 50% point bonus ($300): Platinum Preferred members enjoy the same bonus as Gold members, earning an extra Starpoint per dollar spent. With an annual spend of $12,000, that works out to 12,000 bonus points, worth $300. Late check-out ($75): Same benefit, more frequent utilization. Upgrades ($1,250): As a Platinum member, you’ll also enjoy space-available upgrades at all brands except Aloft and Element properties. However, this is actually to the best available room at check-in, including standard suites. I’ll use the same $50-per-stay valuation I used for other chains but assume that only 25 of the 30 stays take place in applicable hotels. Welcome gift ($600): Platinum members also enjoy a welcome amenity at check-in, and these options were enhanced back in 2012 to include complimentary continental breakfast. I’ve found this choice to be far and away the best option at properties like the Equinox Resort & Spa and St. Regis Bal Harbour. Even though we got a ton of value out of this welcome amenity on past stays, I’ll keep this at the same conservative $20 per stay I used for other chains. Complimentary health club and club-level access ($200): In addition to enjoying free breakfast, Platinum members will also get free access to health clubs and the club lounge, even if you aren’t upgraded to a club room. The amount of value you’ll get from this benefit (naturally) depends on how frequently you stay in properties with these clubs that would otherwise charge a fee. Guaranteed availability ($20): You’re guaranteed a room as a Platinum member when you book by 3pm local time 72 hours prior to arrival, though it carries the usual ways for hotels to opt out. Crossover Rewards with Delta ($140): Platinum members can also take advantage of the Crossover Rewards program with Delta. However, in addition to earning 1 Starpoint for every dollar spent, you’d also enjoy a number of elite benefits when flying with Delta, including priority check-in and boarding, a free checked bag and complimentary upgrades. I’ll assume some additional travel with Delta ($1,500, leading to 1,500 bonus Starpoints, worth $37.50) and peg the elite benefits at $100. When you hit the 50-night threshold, you can choose 10 Suite Night Awards as your choice benefit. While Platinum is officially the top tier in the SPG program, the program did add incremental benefits for those members who hit progressively higher night thresholds as part of the enhancements to the program back in 2012. The first set of benefits kick in at 50 nights, so for this first analysis, I’ll assume that you have the same number of stays as a “regular” Platinum member but complete at least 50 nights. Choice benefits ($500): As of March 9, 2015, SPG added a new selection of Choice Benefits for those hitting the 50-night threshold, though several of these have been changed for 2016. Gifting Gold status could be quite valuable for a friend or family member, and many like the Suite Night Awards (though I had mixed experiences with them). I’m definitely intrigued by the free night award at a Category 1-5 property, which could be the equivalent of up to 16,000 Starpoints, and suite upgrades can save you hundreds of dollars per night — if they clear. I’ll peg this benefit at $500. Your elite bonus jumps to 100% when you pass the 75-night threshold with SPG. When you reach 75 nights with SPG, a couple of additional benefits kick in that can be quite valuable. For this analysis, I’ll assume that you have the same number of stays (30) and spending ($12,000) as a “regular” Platinum member. 100% point bonus ($600): Instead of earning a 50% bonus, 75-night Platinum members will earn a 100% bonus, giving you 2 extra Starpoints per dollar spent. With $12,000, that equates to 24,000 points, worth $600. Your24 ($100): The final perk for 75-night Platinum members is Your24, which allows you to choose your check-in and check-out time. However, TPG was underwhelmed with this benefit back in 2013, since it’s based on availability. I’ll peg this at a conservative $100. 100-night Platinum members get assigned an ambassador to handle any and all requests. The final tier is reserved for those travelers who reach 100 qualifying nights in a calendar year. I’ll again assume the same stay activity with just 100 qualifying nights. Ambassador ($200): When you cross the 100-night threshold, you’ll enjoy Starwood Ambassador status, giving you personalized service from an assigned point of contact before, during and after your stays. TPG wasn’t too impressed with this benefit when he first had it back in 2013, but I’ve read many reports of 100-night Platinum members who really benefit from this service. I’ll peg it at at $200. Whether it’s worth it for you to earn SPG elite status is entirely dependent on your individual situation. 1. How much will you be traveling in the future? If you go out of your way to earn a given elite status level, it would be a shame to not utilize the benefits as much as you’d like. 2. What’s the incremental value of one level over another? If you’re close to qualifying for the next level, consider the additional (or enhanced) benefits you’d get. There’s no sense in making a mattress run to earn status when the additional perks you’d get don’t matter to you. 3. Would you sacrifice price or convenience for elite status? One of the hardest things to quantify in this hobby is whether or not it’s worth booking with your preferred hotel chain if it isn’t the most convenient or cheapest. If you’re attending a conference in a hotel that isn’t your favorite brand, only you can decide whether you should look elsewhere. While the answers to these questions won’t give you an absolute answer, they can help bring out the key considerations to be made as you’re deciding whether you want to push for the next status level (or whether you want to earn status at all). Whether or not it makes sense for you to pursue status with Starwood Preferred Guest depends on a number factors, but it’s worth noting that the clock on these elite benefits is likely ticking, given the upcoming Marriott and SPG merger. I have had some great experience as both a Gold and Platinum member across many of the chain’s brands, so I hope things won’t change too drastically when the programs are integrated. Until that point, I hope this post has given you a framework to utilize as you try to evaluate whether SPG should be your program of choice. How do you value Marriott or Ritz-Carlton elite status?